Meal Kits will be available to pick up at The Pod @ Frinklepod Farm starting Wednesdays at 11am and can be picked up anytime during our business hours through the week: Wed 11a-6p, Thurs 11a-6pm, Fri 11am-5pm, Sat 9a-3pm. (These hours may change later in the winter but we will of course keep you posted!) In general, you should plan to use your kits by Sunday-ish. We are no longer going to be offering Quest Fitness as a pick-up location; our apologies if this option worked well for you but unfortunately it did not work easily for us. The price of each kit has increased by $1 to $21 to help us cover online credit card processing fees. In our continued efforts to “green” our business and reduce packaging, every kit will now include two mason jars in which some of your ingredients will be stored. You will be charged a deposit of $1.50 per jar - a total of $3 for both jars in your kit - and will receive this deposit back in cash when you return the jars & their lids. Thus, you will be charged $24 when ordering a meal kit, but will receive $3 back upon returning the jars. As always, your feedback and ideas are valuable to us, so be in touch anytime! Forget all the "wild rice" you've eaten that has most likely been cultivated in paddies in California. This rice is the real deal, actually a species of grass, that grows wild and is hand-harvested by canoe in lakes in Minnesota (by friends of ours!) The taste is like none other and is perfectly complemented by the earthy flavors of onions, celery, and sage. Add some color to your plate with roasted local pears, Frinklepod salad greens, and an oil-free vinaigrette that will make you want to lick your plate clean (go for it)! Click here for a 3 minute video about the wild rice you're about to eat! Meal B: Mexican stuffed peppers. I have always found any dish that is called "stuffed ..." to be especially filling. Is this psychological or would it be this way even if with a different name? 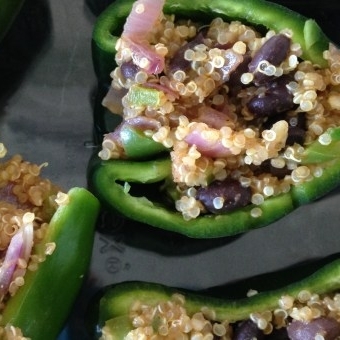 Well, call these what you will, but you will definitely enjoy stuffing the beautiful sweet peppers with a quinoa-black bean mixture, popping them in the oven, and then serving with a lime-cashew cream.